The Georgetown Lions Club Parade started in 1932 and has been a continuous event since that time. The parade is now an evening event starting at 5:00pm and ending approximatley at 7:00pm. 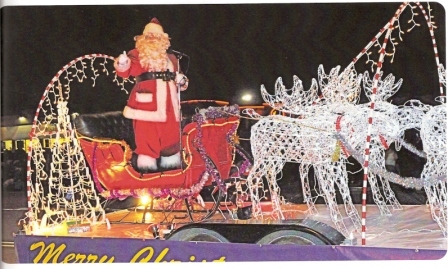 The over 80 entrants feature floats with many lights making it truly a memorable evening.Of course the main feature is the arrival of Santa Claus who rides in the Lions Club Sleigh. While the Town of Halton Hills provides assistance with the event the Lions are fully responsible for the oganization and costs of operating the parade. 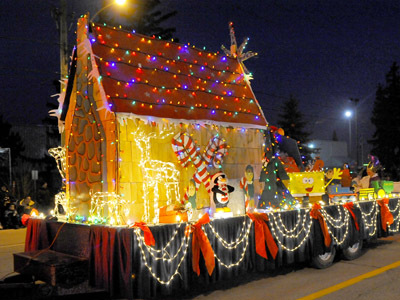 The parade starts at Sinclair Ave. and Guelph St. in Georgetown and goes west along Guelph St. turning left on Mill St. to Charles St. finishing at the Georgetown Fairgrounds Park. The parade assembles on Sinclair Ave, and Todd Rd,. registrants are encouraged to arrive via Todd Rd. at Mountainview Rd. N. PLEASE NOTE PRE-REGISTRATION IS REQUIRED AS ALL THE SPOTS ARE PRE ASSIGNED. Once your float has been registered you will be emailed further information and assigned a number. The numbers are displayed on stakes along the side of the road, it is importanct that you park in your assigned space.